The BBC says that she; "shaped the politicians that we have today" and with this, we agree. She killed-off the creative and industrial hub of the UK in favour of turning the UK into a financial services centre that wrote its own rules and that David Cameron now protects - meaning that most of the world's criminal banks now operate from out of London, yet her supporters say her policies have got nothing to do with our present situation? It could be easy for any government to develop their country's economy at social and environmental expense but, the art of positive and creative governance is to be able to find a solution that enhances an economy with as less disruption to community life as possible and to at least provide support mechanisms for communities that will be decimated by harsh and sweeping policies and in Margaret Thatcher not doing so [with regards to the coal industry], she demonstrated that she didn't care for these communities and their suffering and, her rhetoric at the time also demonstrated that she relished her battle with the unions. Our view is that between them, both Margaret Thatcher and union leader Arthur Scargill destroyed both the industry and the communities because, it was Arthur Scargill who refused to follow due legal and democratic process by refusing to ballot his members before taking strike action. In refusing to ballot his union's members for their vote, his campaign became vulnerable because it stepped outside of the framework of the law. She did succeed in turning the economy around but, at an expense that we are all now sharing today and with regards to her educational policies; she took milk from the mouths of the nations children [despite opinion polls demonstrating that the tax payer was happy to continue to fund this] and, she cemented a curriculum that still hides the fact that free, clean and endless energy has been possible since at least the 1930's [via Tesla] and that [along with Rupert Murdoch and the BBC] still conditions children into believing that the word 'democracy' means 'freedom' and the effect of this alone has completely disempowered an entire nation. The true but little-known [thanks to Rupert Murdoch and the BBC] policy that Margaret Thatcher implemented so as to rescue the UK economy was to massively increase the export of our North Sea oil reserves [just as Gordon Brown later sold-off our gold reserves]. Between 1979 and 1991, UK oil exports rose from approx. 1.6 M barrels per day to approx. 3.6 M barrels per day. She divided communities along many lines and, the only time that the UK went to war under her Premiership was for her to flex her imperialistic ego for the sake of domestic votes, never to defend our country from invasion and, David Cameron's "sick" British society is ill due to the long-term effects of Thatcherism itself. Under Margaret Thatcher, VAT doubled, unemployment rose from 1.4 M to 3.5 M [during 1979 to 1982] leading to 1 in 8 working-age adults being unemployed and in Northern Ireland, the rate was 1 in 5. Crime rates rose with vehicle-related theft, domestic burglary and violent crime all increasing - compared to Labour's 13 years in power when all crime fell and was down by 43% in total and, Margaret Thatcher created the climate for the current slide in the UK economy through easy credit for consumers, personal debt, deregulation of markets and financial speculation. Margaret Thatcher was closer to Rupert Murdoch than any other Prime Minister was previously and this led to the birth of a culture that chose selfishness over compassion and greed over sharing, and that became conditioned into despising claimants of Welfare benefits as state scroungers and those who want "something for nothing" - even though the Welfare State is funded by those who use it. We believe that the youth of the riots in 2011 are the real children of Thatcher because, it was her ideology that they were enacting. In our opinion, Tony Blair and David Cameron are both the true sons of Thatcher and by voting for either, the electorate has been voting for irresponsibility and for an on-going increase in divisions within our communities and this is why nothing has really changed since Thatcher. The People's Administration believes that all governments since Thatcher have gradually and quietly shifted the response/community ratio of the work load of all three emergency services so that we only see them when they are responding to threats and never in a community role. When did see the police, ambulance or fire service coming into your child's school? This stopped when Thatcher decided to take milk away from children and we do not think the timing was a coincidence and instead, think that it was representative of Conservative thinking towards the vulnerable. Along-side this, the ratio of television exposure given between police response work and police community work [both fictional and non-fiction] has shifted so much towards response programming that we only now see the police when they're responding - never seeing anything of their community work. At the same time, Whitehall directives restrict the police from funding any community work - ensuring that on or off-screen, we only ever see the police in response mode and, the People's Administration believes that this is a fundamental propaganda tool that the state is intentionally using in order to alienate the police from the people. David Cameron is the first ever UK Prime Minister to ban police forces from budgeting for community work. We believe that there has been an on-going conspiracy behind Whitehall [now involving Rupert Murdoch's media and hidden groups of varying nature] that has been influencing successive governments [via policy formation] since Harold Wilson took office. This is a theory shared by many reputable individuals and organisations [including high-ranking members of the emergency services] and, we believe that this conspiracy is oriented in dividing communities and alienating the emergency services so that they can be used as a cushion to protect governments [as what happened in 2011] when these governments over-exert their control and oppression. We believe that UK governments have been consciously dividing communities simply to further their control [something that was learned during the formation of the British Empire] and we believe that Rupert Murdoch himself has been instrumental in this process [for his own commercial and political gain]. If you ever see the police performing community-related work, it will only be because those particular officers have chosen to give up their own time outside of work hours so as to connect with their own communities. It should be highlighted that the founder of the People's Administration was himself a victim of a serious police conspiracy during 1999 which was successfully resolved through a series of closed court hearings and so was not publicised but despite this, he still believes that as with any institution, there will be those who maintain their integrity as well as those who are weak and corrupt. It is during the Thatcher era that Parliament as an institution became wholly non-representative of the UK people, instead favouring to support the desires of the media, the religions, the unelected lords and consultants [such as multi-millionaire Alan Sugar], the corporates, the banks, the Rothschilds, the Rockefellers and hidden organisations [shadow governments]. This is the essence of Thatcherism and it's still with us today, maintained and enhanced by both Tony Blair and David Cameron. Margaret Thatcher blocked a ban on the ivory trade and supported the racist apartheid system in South Africa and when Chili's brutal unelected dictator General Pinochet was facing justice for murdering, imprisoning and torturing civilians [including women and children], she gave him sanctuary in the UK until international law forced her to hand him over to the ICC. Under a secret pact made with US President Ronald Reagan, she sold WMD's to Iraq's Saddam Hussein to be used against his own Kurdish citizens [in northern Iraq] and against Iran, while the US supplied weapons [ref: Oliver North] and intelligence on Iraq to Iran and between them both, they armed Israel, Saudi Arabia, Bahrain and Kuwait to the teeth [a policy that David Cameron has reinvigorated] along with privatising aspects of the state that should simply never be made vulnerable to the requirements of having to make an ever-expanding profit margin for services that would constitute a 'need' [such as water, gas and electricity]. It is this that has led to the UK people having to pay extortionate rates for energy while utility company CEO's make millions every year for doing no more than pushing a pen, while their most vulnerable customers die on a yearly basis due to not being able to pay their energy bills. Many of her policies that were sold as opportunities [such as enabling for tenants of social housing to buy-up social housing stock] have led to most of the negatives that UK society now endures [such as a severe lack of social housing] and, she ran her cabinet by dictat and not by debate [therefore disregarding the views of those who were supposed to represent the voter] and her inability to compromise was marketed as a strength and so, we find it no coincidence that those who now adulate her are either foreign, rich, or were never on the receiving end of her wholly destructive policies or propaganda. Margaret Thatcher laid-down the template that UK partisan politics now adheres to and that willingly chooses to represent corporates, criminal banks, shadow governments and foreign governments over its people and, that now protects the 1% from prosecution even when found guilty. The only aspects that the People's Administration can respect in Margaret Thatcher was that she at least had conviction and at least had an ideology. The fact that we find her ideology socially destructive is a separate issue but, ideals are something that David Cameron has already told the country that "I do not do" - while refusing to listen to those outside of his circle. With regards to being a strong leader, we judge how she chose to use that strength and, if her strength was simply her inability to compromise being misread, then we view that she used this 'strength' to the detriment of everyone but herself. However, we do feel that her notion that there is "no such thing as society" was correct because, if you ask yourself what 'society's' opinion would be regarding any issue [for example], you find that your answer depends on what aspect of society you ask. If you think that society is everyone, then everyone would have the same answers to ALL questions and everyone would therefore share the same attitudes, outlooks and philosophy but this simply isn't the case. There are also no such things as wrong or right, good or bad, big or small or facts even because, all of these things are merely opinions and they vary from time to time, culture to culture and person to person. None are solid tangibilities or facts and all are instead perception-oriented opinions and nothing more. For example; humans may perceive a mouse as being small but, an ant may perceive the exact same mouse as being massive. If both are true then which one is a fact? The answer is relative to the perception of the observer and so will vary depending upon who [or what] you ask. For decades, it has actually been an integral aspect of Western legal training at the top, to show of how there are no such things as facts. What was extremely telling though [which no one in the mainstream has picked-up on] was when she then adds; "...just pockets of individuals." implying that there is no such thing as community, and with this we completely disagree. To the hundreds of thousands of UK households that will be celebrating tonight and again on Wednesday 17th April, we are still enduring community-destroying Thatcherism and so we must not be denied our right to express our opinion regarding how we feel about this - however politically incorrect so, have a good one! PA direct democracy video: Thatcher is dead - Time to party! Singer Morrissey sums-up our view; "Thatcher is remembered as The Iron Lady only because she possessed completely negative traits such as persistent stubbornness and a determined refusal to listen to others. Thatcher will only be fondly remembered by sentimentalists who did not suffer under her leadership, but the majority of British working people have forgotten her already, and the people of Argentina will be celebrating her death. 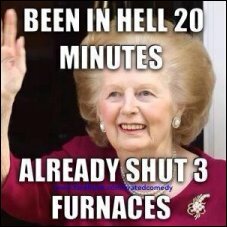 As a matter of recorded fact, Thatcher was a terror without an atom of humanity." ...Margaret Thatcher to be buried at St' Paul's? Shame - the lady's not for burning?